This walk: 2012-2-22. Ringmoor Down, medieval farmsteads, longhouses, Legis Tor, vermin trap, Legis Lake, cist, stone row and circle. Strollers negotiating the stile from the car park at Ringmoor Cottage onto Ringmoor Down. Looking ahead to the abandoned farmstead in the middle of Ringmoor Down, where the grazing seems to have been kept improved by modern cattle grazing here and less on the surrounding Molinia caerulea, or purple moor grass. Farmstead #1, the longhouse complex at SX 5699 6643; there are actually two longhouses at this location. Another part of the longhouse complex. Looking approx. SSW at the top of a gert from Legis Lake, from when the tinners were active hereabouts. The outside of the corn ditch. Approaching Legis Tor in heavy rain! Location: SX 571 656, elevation 310 metres (1017 feet). .... and from the other end. A widening in Legis Lake, running from Legis Mire. Cist at SX 56594 65764, in a small cairn that is surrounded by kerb stones ..... described by J. Butler (1994), Dartmoor Atlas of Antiquities III, The South West. 49.21 Ringmoor Down west cairns, fig. 49.21.1, pages 144-145. Ringmoor Down stone circle and row: looking from inside the stone circle along the stone row (1740 feet long) that runs in a NNE direction. The monument was largely re-erectoedin 1909. It is described by J. Butler (1994), Dartmoor Atlas of Antiquities III, The South West. 49.20 Ringmoor Down stone circle and row, figs. 49.20 & 49.20.1, pages 142-143 . Overview of the circle with the row behind the people. 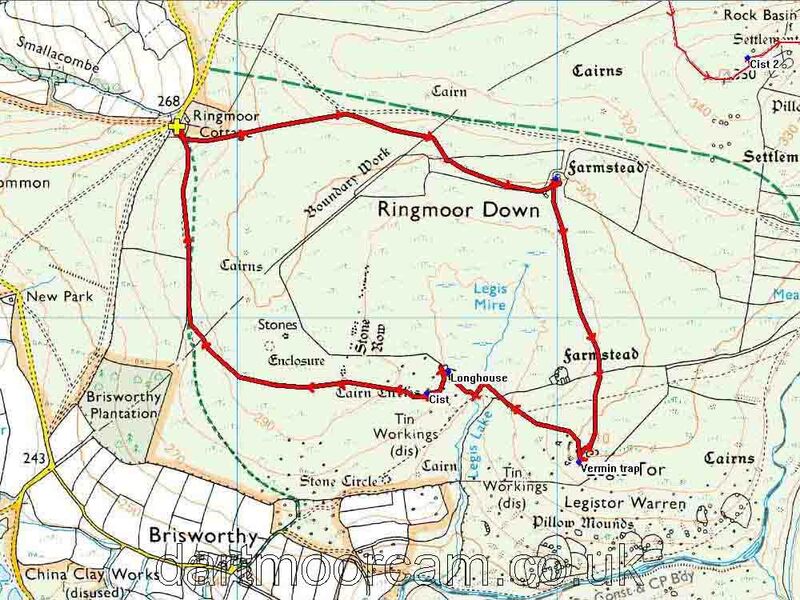 This walk was reached by approaching through Clearbrook, passing Hoo-Meavy, driving to Brisworthy Plantation, turning left towards Meavy, turning right before Marchant's cross to Ringmoor Cottage, parking at the yellow cross.